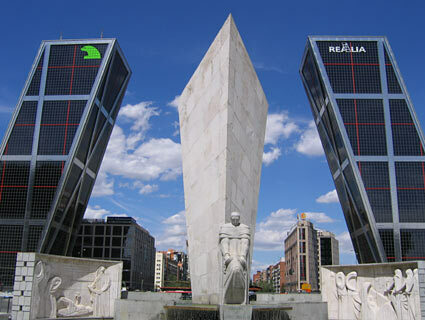 We were in Madrid last weekend and saw the Puerta de Europa (‘Gateway to Europe’) towers, the world’s first leaning high-rise buildings. They were built in 1996 and designed by the American architects Philip Johnson and John Burgee. 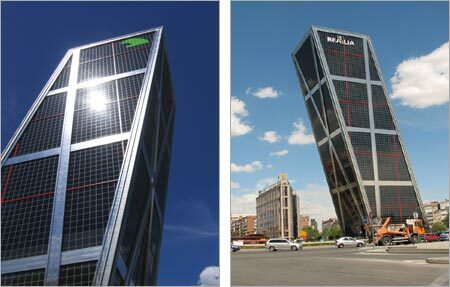 Each building is 115 m tall, or 26 stories, with an inclination of 15º, or more than twice that of the ‘leaning’ (pfft) tower of Pisa. The buildings were very impressive. We visited them on our Madrid Vision tour; we got out at the Estadio Santiago Bernabeu of soccer team Real Madrid (stop 7 on the blue line) and walked in about 30 minutes from Plaza de Lima to Plaza de Castilla. This entry was posted on Sunday, September 3rd, 2006 at 5:32 pm CET and is filed under Travel	with tags . You can follow any responses to this entry through the RSS 2.0 feed. You can leave a response, or trackback from your own site. Madrid – The Capital of Spain, several-millions city located in the heart of the Iberian peninsula, almost in its geographical center. I like this city and can tell this is my favourite place all over the world. Great architecture, great style and great people. Wow, I have never seen architecture like this. 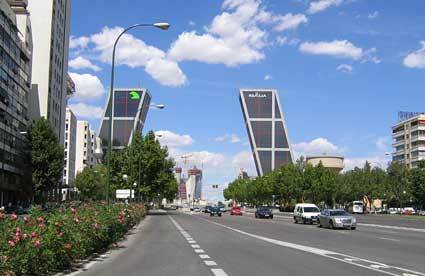 I will have to see the Puerta de Europa towers on my next visit to Madrid. Are these functional buildings?